The 12 zodiac signs all have a planetary ruler that was assigned to them based on the observations of astrologers over the years. These rulers are not coincidental. The more you delve into the characteristics of the planets, and assess their physical nature, the more insight you gain into the zodiac sign and it becomes clear that the planets and signs are parallel. Now is the time to dissect astrology’s God of the Sea. This is a concise, crisp examination of the planetary features of Neptune, and I wanted to emphasize the characteristics that revealed a link to the sign of Pisces, so it is by no means, finely detailed (sorry Virgos). Neptune is the planet of illusion and deception, and symbols of these characteristics can be found in nearly all of the ice giant’s physical traits. I’ll begin with the atmosphere of Neptune, a concoction of hydrogen, helium, and methane. When you look at pictures of Neptune, you see a delightfully peaceful blue color, and that is a product of the methane, which absorbs the actual color of the gas giant, red. There are high, thin clouds drifting in the upper atmosphere, and large storms and high speed winds, the climate can be described as “very active”. The mantle inside is roughly 15 times the size of Earth. Neptune is not solid body, despite being the densest planet in the solar system, and it is smaller than Uranus, but has a greater mass. The internal heat source of Neptune is rather high, almost doubled that of Uranus. 14 moons have been pulled into the gravitational field of the planet. Though we have many visuals, the planet is not visible to the naked eye. 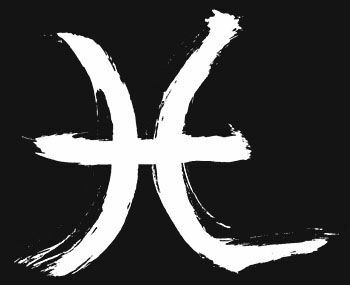 Pisces is one of the most multidimensional and opaque signs in the zodiac, so it makes the people ruled by the sign or Neptune very hard to spot, but usually the dense emotions are what dominate and distinguish Neptune and Pisces. As compared to Aquarius, this water sign has a much larger capacity for compassion, and indeed what makes Fish so “heavy” is their amount of love. Mass = heart; they love hugely, and are far deeper and more complex than the Water Bearer, with loads more strength of feeling. Their emotions are just like the planet’s climate: supersonic storms, with winds blowing at high speeds. But sometimes these storms confuse Pisces, and make it extremely difficult for the Fish to know whether a flood of feeling has roots in their own heart, or was instigated by something outside of them. Pisces never violently show their inner torment, preferring to distance themselves and seek isolation in attempts to sort through the hurricane. Feelings whirl around and through them creating tempests of sensations, even if for a moment, and they change like the wind; blowing here, there, and everywhere the wind takes them. 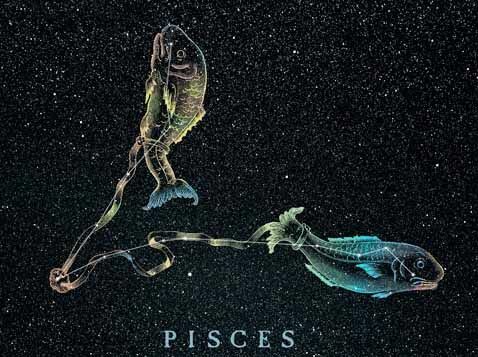 If you look at Pisces closely, you’ll see them silently morph into an image that they believe you wish to see. 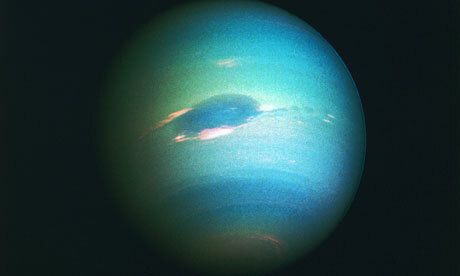 Their version of methane, the substance that changes the color of Neptune, is their mutability. No other sign is more adept at adapting, and there is usually a harem of personality traits swimming in the ocean of Pisces’ soul. Both the methane cloud and the 14 moons surrounding the planet represent the components of Pisces’ personality that are meant to diffuse and confuse those who attempt to study or watch the Fish. Like Neptune, Pisces would much prefer to not be seen by the naked eye. But since complete anonymity is not a realistic option for them, they use their adaptability as camouflage to protect their core from full exposure. Like Neptune, Pisces has a huge mantle, which I related to the heart, and their ability to love so purely, but it has a lower temperature than other signs. And Pisces are not solid body. On planet Pisces, there is nowhere to stand, and no way to establish any roots, but the Fish like it that way, because it keeps them floating. The only problem with being a floater is that you eventually sink. Without the grounding and fertility of earth, or the spirit of fire, Pisces dream away and drift along. Although Neptune has an internal heat source, it is much weaker than that of the other planets. They wish, pine, and suffer, but they seldom want. Fire desires, earth collects, and both signs have the drive and passion (fire, heat) and the strength of purpose (earth, solid body) to get what they want. Pisces often rely on the oomph emitted by others to propel them to go after what they want, they have an internal heat source, but it can only be stimulated and warmed by something they believe to be meaningful. Their inner pool of longing simmers on occasion, but it never boils (because they are too far from the sun). And because they don’t exhibit an air of aggression or persistence, many believe them to be weak, but this is misleading. The magnetic field of Pisces is more powerful than any other fire or earth sign, and all their wishing and hoping leads to the manifestation and actualization of Neptunian dreams. Pisces get the very same, if not more than earthlings, simply by not aggressively pursuing. They do nothing aggressively or stubbornly, yet they achieve the same result (usually). Neptune is one of the most infinitely mysterious subjects of astrology (and one of my favorites), and I hope this factual and poetic examination has cleared some of the mud that usually hides the planet and its sign Pisces from the light. It is curious and almost creepy how relative the planets and signs are, especially the outer planets, which are said to have more of an effect on a generation as opposed to an individual. I am continuously fascinated by the correlation between the signs and the planets, and will cover all 10 of the planets, so stay tuned! And let me know what you think of this series in the comments below!